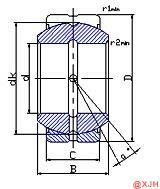 Because Spherical Plain Bearing GEZ.FO 2RS Series has very strong adjustability and is a two-ball ring sleeve, its biggest feature is its ability to carry a large load and test a spherical surface on a sliding surface, so at a certain angle You can do tilting movements, that is, you can continue working when the product has a large heart. Its structure is very different from other bearings, and it must be completely different in use. The Spherical Plain Bearing GEZ.FO 2RS Series can withstand large loads, so the structure can be changed to different types, allowing it to withstand multiple loads. It also has a lubrication function, which is to put a composite material on the outer surface of the inner ring, which plays a role in lubrication. This effect is widely used in some professional machinery and hydraulic engineering.